We are a full-time Martial Arts School and are passionately dedicated to the principles of TRUTH, RESPECT, UNITY, TRUST, and HONOUR. Our purpose is to introduce and instruct individuals in all the arts that we offer/teach here at Triunity to be used as a "vehicle" to our community by which our practitioners from all backgrounds, may grow PHYSICALLY, MENTALLY, SOCIALLY and SPIRITUALLY. Will fulfill its vision by closely monitoring, developing, supporting, and governing all of its practitioners. "Register for our next upcoming workshop now"
TRIUNITY OPENED ITS DOORS IN APRIL OF 2007 AND HAS BECOME ONE OF THE FASTEST GROWING MARTIAL ARTS STUDIOS IN BC. Recently awarded the "Martial Arts School of the Year" for 2011, 2012, and 2015 by our community of Surrey. Also voted the best martial arts school in 2016 by the Consumer Choice Awards. 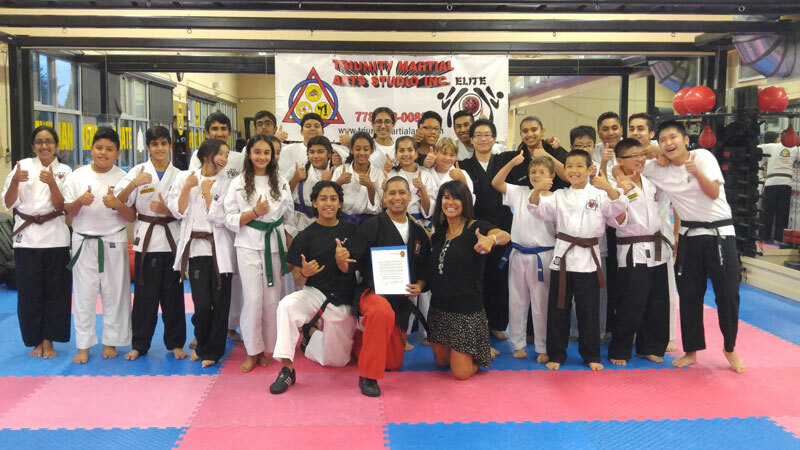 we are pleased to offer a wide variety of programs to suit your wellness needs such as Hawaiian Kenpo Karate, Brazilian Jiu-Jitsu, Muay Thai and Reality Based Self Defense workshops for kids and women only. You can find it all here, at Triunity. We offer programs to suit busy lifestyles for children, teens, adults, families, single parents, civic groups and government organizations. Our team includes Mitra Castano (Owner/Director of Operations), Sensei Carlos (Head instructor), Sensei Emillio (Instructor), Sensei Nick Yee, Sensei Alex Phung. Coach Gari Cortes (Head coach), Coach J.P., and assistant coach Monty for our teens/adults and our kid's Only Jiu Jitsu program. Coach Karim Chadli (Head coach) and assistant coach Jordan M. for our Muay Thai program. and many more qualified assistant instructors who will get your workout/program of choice working for you! Mitra Castano would be happy to assist you in finding the program that best suits your busy life style. All that you have to do is make the "choice" to come on in. In addition we would like to thank all of our amazing students, parents and community organizations as it is through all of you that we continue to grow.